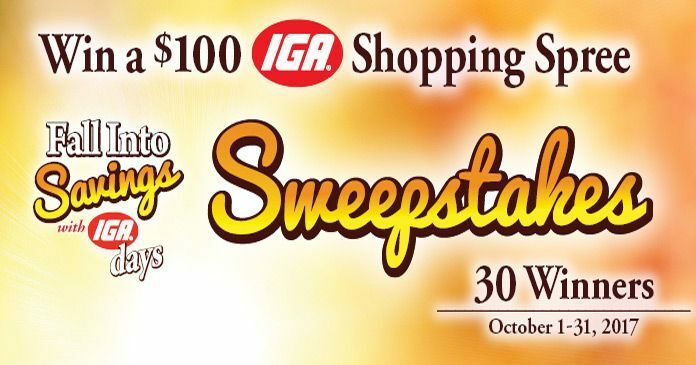 In October, fall into savings with IGA Days and this new Sweepstakes offering you the chance to win a $100 IGA shopping spree, all month long. Enter now for your chance to be one of the 30 lucky winners. The IGA Days Fall into Savings Shopper Sweepstakes is open only to legal U.S. residents and the District of Columbia who are 18 years old or older as of date of entry. Begins at 12:00:01 a.m. CST on October 1, 2017 and ends at 11:59 p.m. CST on October 31, 2017. Visit www.iga.com/sweepstakes.aspx during the Sweepstakes Period and complete and submit the official entry form to receive one entry into the Sweepstakes. Limit one entry per person per day. The potential winners will be determined by random drawing from all eligible entries on or about November 6, 2017 and will be notified by Sponsor or its representative by phone, e-mail and/or mail using the contact information provided at the time of entry. Each of the 30 winners will receive $100 worth of IGA gift certificates. To receive a list of the winners, send a self-addressed, stamped envelope to be received by no later than November 6, 2017 to: IGA, 2017 “IGA Days: Fall into Savings” Sweepstakes Attn: Winner List, 8745 West Higgins Road, Suite 350, Chicago, IL 60631. IGA, USA and its affiliates and partners 8745 West Higgins Road, Suite 350, Chicago, Illinois 60631.